Craving pizza? You're in luck: a new business has opened its doors in the neighborhood. The new addition to Rittenhouse, called Alice Pizza, is located at 236 S. 15th St.
Alice--pronounced ah-LEE-chay--features a patented pizza al taglio technique, which uses a limited amount of yeast in the dough and requires 48 hours to rise. 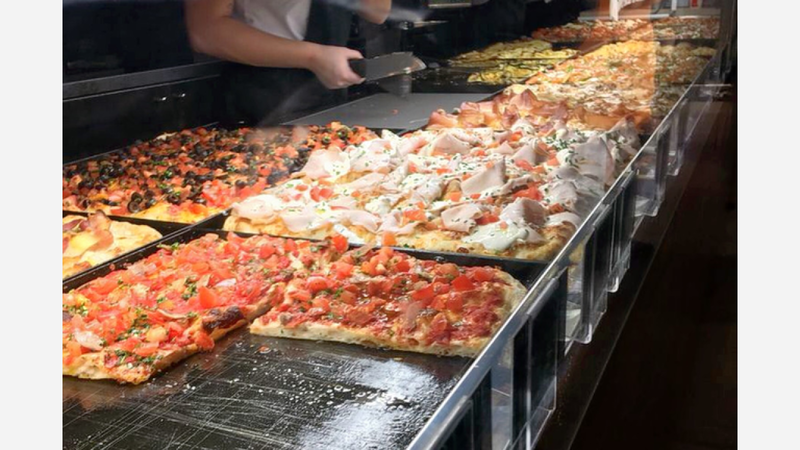 This new pizzeria is the first U.S. outpost from pizza maker Domenico Giovannini, who got his start in 1990 with a pizza shop in Via delle Grazie, near San Pietro, Italy. Pizzas here are generally sold by the weight of the slice, and are served by "bartenders" behind the counter, similar to Alice's flagship location in Rome, Italy. Personal size pies are available as well, with options like margherita, pachino e bufala with tomato, tomato pulp, and buffalo mozzarella, and capricciosa with tomato, egg, prosciutto, artichoke, and olives. Alice offers American-style breakfast pizzas with scrambled eggs, bacon, potatoes, and mozzarella as well. A full salad bar is also available. Rounding things out are an array of Italian pastries like ricotta cookies, cannoli, and pignoli cookies. Alice Pizza has proven popular thus far, with a four-star rating out of 22 reviews on Yelp. Sid M., who was among the first Yelpers to review the new spot on December 7th, said: "Some great pizza and espresso here. Looking forward to trying out the pastries and gelato soon!" Yelper Morris B. added: "I heard Alice Pizza was coming to town, and all the raves about their 48-hour rising dough process. It sounded amazing, plus they have a dessert and wine bar, so obviously worth a try." And Carla T. said: "Alice uses a 48-hour rise with limited yeast that makes the pizza taste light and airy. It has a nice crunch and the flavors really pop. The pizza is baked in trays, and I think that adds seasoning to the crust--very tasty!" Alice Pizza is now open at 236 S. 15th St., so stop in to try it for yourself.